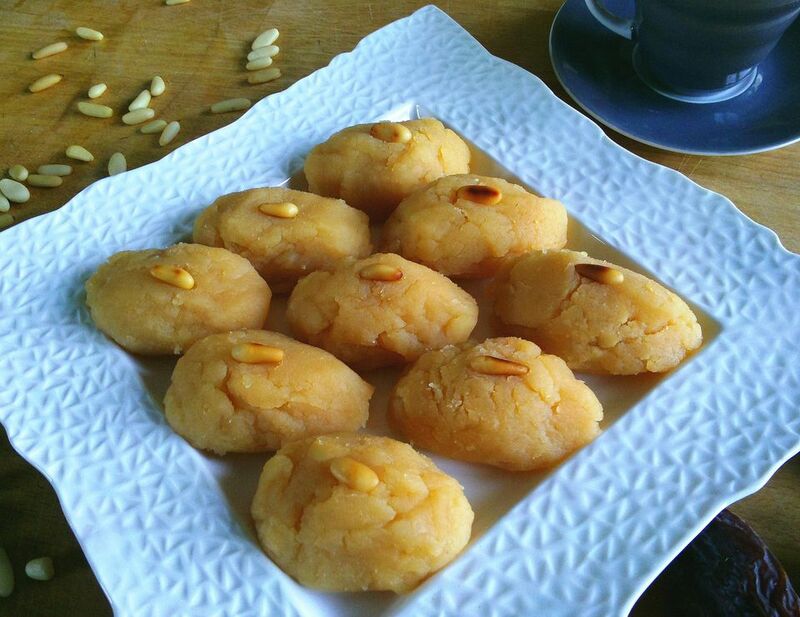 'Helva' is a group of paste-like sweets found in Turkey and throughout the Middle East. In Arabic, the term halva has a broader meaning and can refer to anything sweet. In Turkish cuisine, 'helva' specifically refers to this type of dessert. Helva has been present in Turkish cuisine for centuries. It's mentioned in Anatolian Seljuk literature that dates as far back as the 13th century. In modern Turkish cuisine, there are two main types of 'helva.' The first type is made with a firm nut or sesame seed paste and sold in blocks. This type of 'helva,' called 'tahini helva,' is most often bought in stores. The second type of 'helva' made from starches like flour or semolina is more popular with home cooks. This type of 'helva' is made by toasting the semolina or flour in large amounts of butter or oil. It's then softened with milk and sweetened with sugar, honey or grape molasses called 'pekmez' (peck-MEZ') and left to set. Sometimes other ingredients like cocoa powder and nuts like walnuts, hazelnuts or pistacios are added. Semolina 'helva' is more commonly served at important life events like funerals, weddings and other commemerations. Flour 'helva' is served anytime for either dessert or with coffee and tea. It's true comfort food. Each family has their own reciped for flour 'helva'. This is the basic recipe for plain flour helva I use at home. It's delicious plain, but you can also expirement with different flavorings like vanilla, rose water, lemon zest or cocoa and try different nuts until you find a 'helva' mixture that's perfect for you. Combine the sugar, milk and water in a saucepan and bring it to a boil. Stir it occassionally until the sugar is dissolved then turn off the heat. If you decide add optional flavoring like vanilla, rose water or lemon zest, stir it into the hot milk mixture. Melt the butter in a large, shallow pan. When the butter is bubbly, add the flour all at once. Work the butter all the way through the flour using a wooden spoon. Reduce the heat to low. Stir the flour and butter mixture by turning it over with the wooden spoon. Do this continuosly over very low heat for at least 15 minutes. The flour should slowly turn golden brown and take on a toasted aroma. Make sure to turn the mixture over evenly and be care not to let it brown too quickly. When the flour is ready, turn off the heat. Add the milk and sugar mixture all at once and let it bubble up. Stir the liquid through the flour as it's bubbling. Continue to stir the mixture as it cools down. The helva will begin to bind together and form a ball. It should be soft but firm and take on a shiny texture. While the ball of helva is still hot, you can shape it as you wish. You can use a large spoon to make oval-shaped individual helva, or you can press the helva down in a shallow serving dish. When it's cool, you can cut it into squares. Toast the pine nuts by turning them over in a small, non-stick pan over high heat. Press a pine nut on the top of each 'spoon' helva, or press them evenly in a pattern over the top of flat helva.